As others have said, the tune is awesome - and judging by last year, the party will be too. Looking forward to feburary already. rulez added on the 2011-10-02 09:58:11 by w00t! Good Quartex "remake". Nice tune! 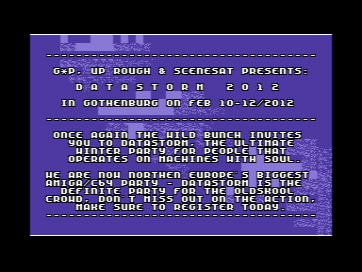 Really looking forward to datastorm! Dalton: close slightly your eyes ;). Not much to see. :P Nice tune. It's what an invitro should be. i like it a lot, nice screen that. rulez added on the 2012-02-13 15:48:12 by ɧ4ɾɗվ. page created in 0.016206 seconds with 16 queries.